Here are tips for people whose work or lifestyle means they are forever staring at a screen. Sedentary work and computer use means you are liable to become stiff in neck and hips. You can take steps to improve your own office ergonomics by working with desk height, chair type and height and position of your screen. 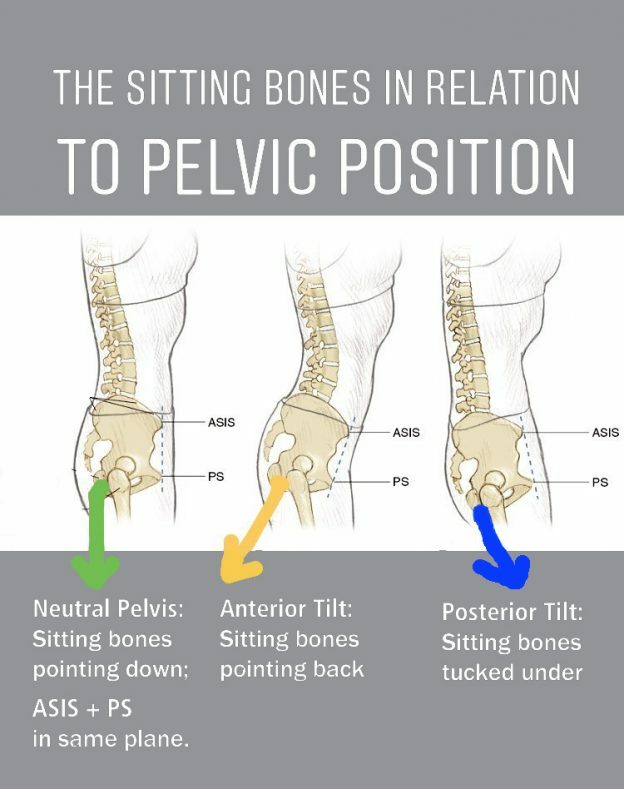 If your chair’s height means that your knee joint is higher than your hip joint, your pelvis will tilt backwards. Your sitbones will be pointing forwards (instead of straight downwards); this make it difficult to stack the bones with your ideal spinal curvature. Your muscles have to work hard to stabilise you, leading to fatigue, tension and pain. Sitting upright is less about core strength and more about stacking your bones properly. You need a good foundation for any structure, most of all your own body! This is the essence of pilates. With your hips higher than your knees you can distribute your bodyweight into your feet, so that you get additional support from the ground up to hold your spine the way it was designed. Bear in mind that stacking the bones of your pelvis, spine and skull in a neutral alignment allows your muscles to relax. Both feet being grounded gives your spine support. Whether standing or sitting, postural awareness starts with good placement of your feet. Place your screen at eye level or above. If you have a laptop, it’s tricky to place it at or above eye level. Short stints on a laptop are probably not a big deal, but if using for long stretches, consider getting an external monitor to plug in. so you don’t compromise your neck and shoulders. When you are concentrating on getting a task done at your desk, it’s easy to stagnate and forget to stretch. While a 20-second neck stretch won’t combat eight hours of computer work, getting up once an hour for about five minutes to walk around and stretch neck, arms, shoulders, spine, feet and hips really does help. Develop a routine of quick and effective moves. The human body is meant to move, flex, extend, twist and squat. It is not designed to sit still for hours on end. So, just do it. Eye strain from looking at screes is a real thing. When your eyes are fatigued, the muscles in your neck are often also tense and painful. The combination of resting the eyes and moving the eyeballs with awareness also soothes your nervous system. Not rocket science: organise your sit bones to point downwards thus finding neutral pelvis, place feet evenly on ground, lengthen up through spine, shoulders back slightly and try to unweight your head by moving it slightly backwards while keeping lifted through crown of head; watch that your bottom rib has not lifted off your abdominal wall! Then close eyes, keeping head still, move eyeballs nice and slowly to the left and to the right, then upwards and downwards, then diagonally upwards and downwards both directions. Do each move about three times each way! This entry was posted in Blog on 16 March, 2018 by Eimear.